So far, our stroll through the Konami Verb-Fest has seen Track 'n Attack and TopVania; but onwards and upwards to the next two games/six verbs. You're dribbling a little, there. everyone else is like, "should I grab the ball? Eh; PASS!" Ok, so I guess it's your ally, professor Nutty Mustache, who got captured...but it still counts! I've dived so low that I'm hiding in the cemetery like a common vampire! 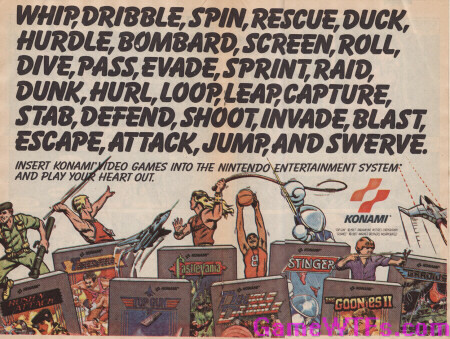 Tune in next week for the exciting conclusive conclusion to our KONAMI Verb List!